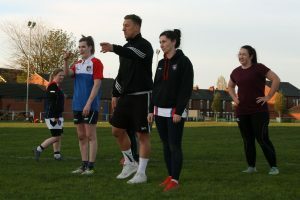 The Wakefield Trinity ladies team recently benefited from a training session lead by special guest Keith Mason. 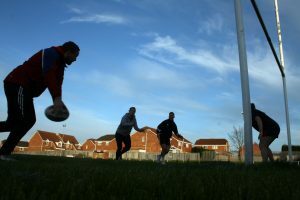 The former Trinity, Saints, Castleford and Huddersfield Giants player put the ladies through a master class of skills and strategy following their recent round 3 win over Stanningley. Mason has appeared in the film Skin Traffik alongside Mickey Rourke and Daryl Hannah and more recently in the TV series Peaky Blinders. Fresh from them their Stanningley victory the former prop forward concentrated on technique rather fitness, but was keen to come back and put the Ladies through their paces not so soon after a game next time. The Dewsbury born star passed on some golden nuggets from his 14 year career to the Trinity players concentrating on wrapping up the ball, running some set plays and scoring close to the line. The Ladies team are enjoying good numbers at training and the squad has been bolstered with the signing of Danielle Swain. The former Bradford Bulls captain will add extra strike to an already formidable pack. The signing comes at a crucial time as Sundays’ victory at Stanningley came at cost. Prop forward Anita Godfrey had to leave the field with a knee ligament injury and will need to see specialists to assess the extent of the injury.